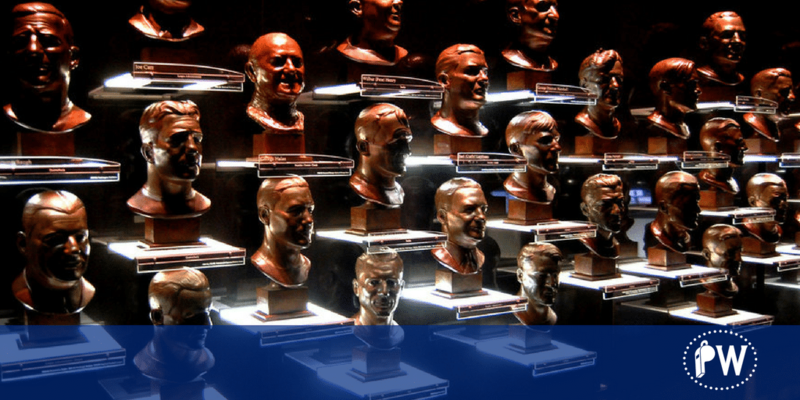 Home » Family Business Blog » Uncategorized » Are You Going to the Hall of Fame in Your Profession? Are You Going to the Hall of Fame in Your Profession? If there was a Hall of Fame in your profession would you be inducted? If you’re a football fan like I am, you always marvel at the Hall of Fame induction ceremony. You get to watch the top players join such an elite group of icons from their profession. I had the pleasure of getting to go to the Hall of Fame in Canton, Ohio a few years back while working with a great company Beaver Excavating in Canton! It was inspiring to be at the Pro Football Hall of Fame in the room with all those legendary people/monuments. What would it take for you to stand out above all the rest over the entire history of your profession? Who would you consider to be the members of the Hall of Fame in your profession? Have you gotten to spend any time with the best of all times in your profession? One of the most important ways to get better at what you do is to give yourself an opportunity to interact and collaborate with the best people in your industry and learn from them. I’m fortunate to be spending the weekend with some of the top professionals in the family business consulting industry this weekend in Scottsdale. I look forward to hearing about their work and accomplishments and sharing my recent body of work and to compare notes. I’m planning on soaking it all up and working hard to use the information to take my game, and my work with my clients, to another level. In three weeks I’ll be in Washington, DC at the International Coach Federation National Conference again to have an opportunity to learn and mingle with some of the best people in my profession, all with the intention of taking the lessons and turning them into improved performance. If there was a Hall of Fame in your profession would you WANT to be inducted? Since my childhood, I’ve always dreamed of best-in-class performance and worked hard be my best at what I was doing. I look forward to putting myself in a position to compare myself to others, all in the service of excellence, not ego. Are you motivated to be the very best at what you do? If so, what actions are you taking this week, this month, this year to improve your skills and stretch the boundaries of your personal performance or industry standards? This may not just be about professional performance. For me, it’s about performance in all areas; a business coach, a husband, a father, a friend, a brother, a son, a neighbor, a citizen and a community member. For me the pursuit of excellence is not a destination, it’s a journey, it’s a mindset, it’s what gets me up every morning and makes me enjoy finding out what I’m made of. I’m really looking forward to the next few weeks and learning from some of the best professionals in my field. I challenge you to stop and take a few minutes and think about your relationship to excellence in everything that you do. If you’re interested in achieving excellence, think about a few steps you can take to put yourself around some of the best people in every area of endeavor. Think about the one or two things you can do to inch your way along towards greatness. Send me a note, I’d love to hear what you’re doing. Your goals may serve as an inspiration to me or others. Knowing about your goals will give me a chance to help hold you accountable and cheer you on. Oh, by the way, have fun along the way and don’t be attached to whether or not you actually make it into the Hall. The guy who I’m one of the biggest fans of, Kurt Warner, was inducted last weekend. Kurt demonstrated another aspect of greatness when he said time and time again, he was not worried about being inducted into the Hall of Fame. He trusted that if it was meant to be it was meant to be. Kurt overcame numerous obstacles and setbacks, and that’s what made his journey that much more rewarding. Kurt said in his speech, “Take your moments, your opportunities when they present themselves and enjoy your moments.” Make your moments, make your opportunities and make the most of them and pursue excellence!